This is all that Cash and his crew at Toronto-based studio Built By Snowman will say about their next game. 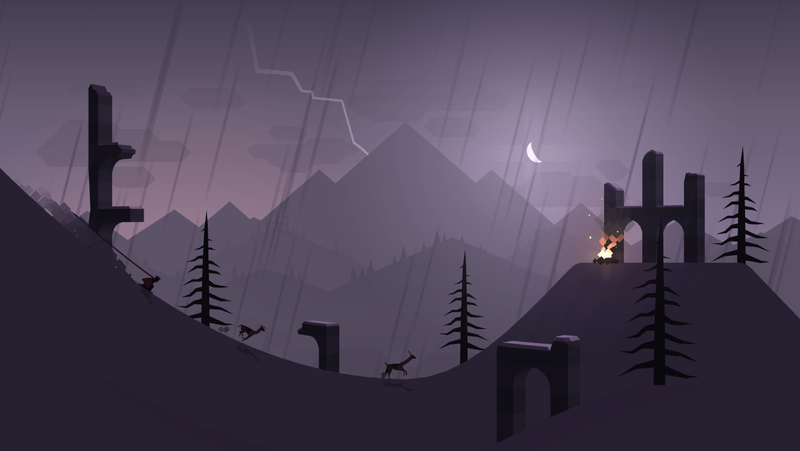 Alto’s Odyssey, due out in 2017, is the follow-up to last year’s downhill snowboarding game Alto’s Adventure, which was released on mobile, and memorable for its stunning moutainscapes, wordless storytelling, and pleasantly looping play. The only clue we have as to the direction that Built By Snowman is taking this sequel is a teaser image released on the game’s official website. It depicts a city surrounded by mountains in silhouette. It’s hard to tell what flavor the studio is going for here but the architecture and birds suggest that it’s different to the Peruvian influence of Alto’s Adventure. It’s hard to tell. In any case, I’d hazard so far as to say that it doesn’t seem to be a place where there’s much snow, so perhaps we won’t be snowboarding this time around? I’m at least glad to see a return of the angular art style and the purple / pink hue of the place recalls the color-coded cycles of the sun as seen in Alto’s Adventure (demonstrated in shots like this). For now, all we can do is sit on our hands and hope that Built By Snowman has more to reveal soon. Oh, and it’s worth noting that the studio is also collaborating on and publishing games now, with the first two titles being Where Cards Fall and DISTANT. Look out for more updates on Alto’s Odyssey on its website.